Two tiers of glazing sweep around a stout olive tree in the back garden of this Rotterdam residence by MVRDV, contrasting with the almost windowless brick walls that face the street and neighbouring houses. 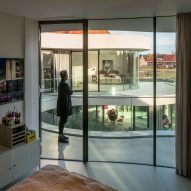 Rotterdam-based MVRDV gave the 480-square-metre property its dual appearance to provide privacy for the occupants of Casa Kwantes, which occupies the corner plot on the site of an old hospital in the Dutch city. 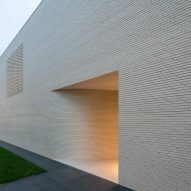 Small cream bricks make up the side and street-facing walls, where an indented entrance and just a couple of windows give glimpses into the residence. The brickwork lends the building the appearance of a simple rectilinear block from the street – in keeping with neighbouring properties – but at the back, undulating glazing following the outline of the olive tree creates a dramatic sweeping facade. A balcony follows the curaveous glazing on the upper floor to allow the residents to look down to a secluded patio surrounding the tree, and out into the south-facing garden. "The curved glass continuously wraps its way around the interior facade on both levels, creating continuous views from one room to another," explained Jacob van Rijs, a co-founder of MVRDV alongside Winy Maas and Nathalie de Vries. "As well as a visual connection, an exterior balcony also creates the opportunity to easily walk from one space to the next without disruption," he added. "The glass reflections of the central tree continuously change and bounce around as one moves throughout the house and changes their perspective." 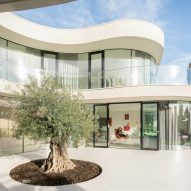 Where the facade dips inwards to accommodate the olive tree, the floor plan constricts to form a corridor-like space before expanding outwards to create two bulbous wings. The corridor creates a natural separation between the wings, allowing for a "fluid" open-plan arrangement of spaces. 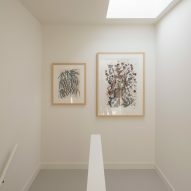 The angle of the sweeping glazing ensures a visual connection between the rooms through the branches of the olive tree, while also blocking views of and from neighbouring houses. A small curving indent in the brick end wall of the house leads into the entrance hall and out into the brightly lit living spaces. Wooden closets form a spine along the length of the ground floor, concealing the entrance to the basement, a toilet, kitchen cabinets and a pantry. A staircase set in the narrowest point of the floor plan separates a library near the entrance from a combined kitchen, dining room and lounge in the other wing. Upstairs, the stairwell breaks the plan to provide privacy for a master suite in one wing and two further bedrooms in the other. Each of the rooms has access to the balcony. "Casa Kwantes bases itself around the clients' desire for seclusion and privacy, whilst having a maximum of daylight and open living spaces," said MVRDV. "Operating within a nostalgic urban requirement, a wall of 1930s brickwork creates a boundary between family and public life towards the street, whilst on the garden side, fluid glass walls sweep around the living spaces, embracing the house's focal point, an olive tree." Inspiration to couple expansive glazing with the slender brickwork of the outer facades was drawn from 1930s modernism – as well as local planning regulations that demanded the house have a semblance to local architecture. MVRDV describes the marriage of these two ideas as "smuggling a swoosh into nostalgic urban regulations". "As the newly built homes in the vicinity are more vernacular in their modernist approach, this variation on a more avant-garde architecture has been the subject of discussions with the municipality," said the studio. "When balancing municipality requirements for a retro-style architecture, the home became a contemporary take on 1930s modernism with its long, cream, shallow brickwork, full-height glazing, and the contrasting integration of the flat and fluid, open and enclosed, flexible and defined." The internal flooring continues across the glazed boundary between the house and garden to create a patio that acts as an extension of the living space during clement weather – and represents these contrasting virtues of "open and enclosed, flexible and defined" . A further patio located at the bottom of the garden is positioned in a sunny spot to provide a barbecuing area. The sinuous edges of the flat roof and upper floor plate cantilever out over the glazing to partially shelter this first patio, and to shade the rooms during summer months. Energy efficiency measures including a ground-source heat pump and solar panels help to offset the energy lost though the abundant glazing. There is potential for the house to become entirely self-sufficient in the future. MVRDV, which came ninth in the inaugural Dezeen Hot List, recently revealed its plans to build a Y-shaped house with a swimming pool cradled into its angular roof in Taiwan and a set of letter-shaped housing blocks that will spell out the word HOME across the site of a former army barracks in Germany.